Willis was raised by his mother, Joyce, a welder, in Alameda, California. She played in elite-level softball leagues when Willis was a child. Willis never knew his father, Clinton Ostah, who was a minor league player in the 1970s. Growing up, Willis rooted for the Oakland Athletics as a child. Willis' favorite player was former Oakland Athletics' pitcher Dave Stewart. Willis attended Encinal High School in Alameda, where he played baseball for four years. In Willis' senior year in 2000, he had a 0.70 earned run average (ERA) with 111 strikeouts in 70 innings pitched and was named California Player of the Year. He initially committed to play college baseball at Arizona State. He was drafted by the Chicago Cubs in the 8th round of the 2000 Major League Baseball draft. In 2001, Willis was promoted to the Boise Hawks of the Northwest League. He finished with 8 wins and a 2.98 ERA. Opposing hitters only batted .217 against Willis. In a Baseball America poll, several NWL managers called Willis Boise's best player. Willis was named Rookie of the Month for the month of June and became the first Marlins pitcher to be named Pitcher of the Month. He became the first rookie pitcher to win Pitcher of the Month since Hideo Nomo did it in 1995 for the Los Angeles Dodgers and he became the first rookie pitcher to win seven straight starts since Jason Isringhausen, also in 1995. In 5 starts, Willis went 5–0 with a 1.04 ERA. Heading into the All-Star Break in mid-July, Willis was 9–1 with a 2.08 ERA in 13 starts. He made the National League All-Star team as injury replacement for Los Angeles Dodgers pitcher Kevin Brown. He became the second Marlins rookie to make the All-Star team; Alex González did it in 1999. In the 2006 season, Willis' numbers were down from his great 2005 season. Willis started the season by going 1–6 with a 4.93 ERA and didn't get his second victory of the season until June 2. He still posted decent numbers for the year and went 12–12 with a 3.87 ERA, including 11-6 with a 3.39 ERA from June to September. His 12 wins were tied for the most on the Marlins. Willis also led the Marlins in complete games (4), innings pitched (​223 1⁄3), base on balls (83), and hit by pitch (19). On July 7, Willis hit a grand slam off of Mets pitcher José Lima. Willis became the first pitcher to hit a grand slam since Robert Person did it in 2002. It was his fourth career home run. On September 20, 2006, he hit 2 home runs, off of Óliver Pérez and Roberto Hernández. He became the first pitcher since Randy Wolf to hit 2 home runs in a game. During his career with the Marlins, Willis went 68-54 with a 3.78 earned run average. 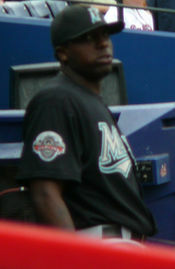 He won at least 10 games each season during all five of his years with the Marlins from 2003 to 2007. In his next start, also against the White Sox, Willis injured his left knee and departed the game before even recording an out. Placed on the disabled list the next day, Willis had walked nine batters while striking out none in his first two outings. Command of his pitches became a trouble spot, and later in the season, Tiger manager Jim Leyland pitched him in relief for the first time, with little success. He was placed back into the rotation on June 3, 2008, to start in a loss against the Oakland Athletics. 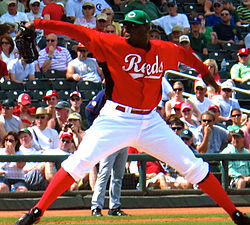 On July 4, 2010, Willis was designated for assignment and subsequently released. Named a starter for the U.S. in the inaugural World Baseball Classic. However, both of Willis' starts in the WBC were considered subpar as the U.S. exited the tournament in the 2nd-group stage. Willis married Natalee Vitagliano on December 6, 2006. The couple have four daughters. ^ Ballard, Chris (June 30, 2003). "The Kid With The Kick". Sports Illustrated. Retrieved 28 January 2018. ^ Simmons, Rusty (April 7, 2004). "Today's players know of Encinal's tradition / Stargell, Rollins, Willis have set high standards". SFGate. Retrieved 28 January 2018. ^ Kornacki, Steve (June 1, 2010). "Dontrelle Willis traded to Diamondbacks; Tigers will pay most of left-hander's remaining salary". MLive.com. Retrieved 28 January 2018. ^ "Cubs trade for reliever Alfonseca". The Philadelphia Inquirer. March 28, 2002. Retrieved January 22, 2015. ^ "Colorado Rockies vs. Florida Marlins – Box Score – May 9, 2003". Espn.com. Associated Press. June 9, 2013. Retrieved June 9, 2013. ^ "Pudge's HR all the support stingy Willis needs". Espn.com. Associated Press. June 9, 2013. Retrieved June 9, 2013. ^ "Willis wins Pitcher, Rookie of Month". MLB.com. Associated Press. June 13, 2013. Retrieved June 13, 2013. ^ "Dontrelle Willis Stats, Splits". Espn.com. Associated Press. June 13, 2013. Retrieved June 13, 2013. ^ "Dontrelle Willis Stats, Splits – ESPN". Espn.com. Associated Press. June 9, 2013. Retrieved June 9, 2013. ^ "Spivey's errant throw helps Willis win 10th". Espn.com. Associated Press. June 9, 2013. Retrieved June 9, 2013. ^ "San Francisco Giants vs. Florida Marlins – Box Score – October 4, 2003". Espn.com. Associated Press. June 9, 2013. Retrieved June 9, 2013. ^ "Chicago Cubs vs. Florida Marlins – Box Score – October 11, 2003". Espn.com. Associated Press. June 9, 2013. Retrieved June 9, 2013. ^ "Willis 3-for-3 with HR; Cabrera homers again". Espn.com. Associated Press. June 9, 2013. Retrieved June 9, 2013. ^ "Willis strikes out in first at-bat". Espn.com. Associated Press. June 9, 2013. Retrieved June 9, 2013. ^ "Dontrelle Willis Game By Game Stats and Performance". Espn.com. ESPN Internet Ventures. Associated Press. June 9, 2013. Retrieved June 9, 2013. ^ "Colorado matches third-longest losing skid in team history". Espn.com. Associated Press. June 9, 2013. Retrieved June 9, 2013. ^ "Delgado drives in all five runs as Marlins snap skid". Espn.com. Associated Press. June 9, 2013. Retrieved June 9, 2013. ^ "Willis is NL's first 12-game winner". Espn.com. Associated Press. June 9, 2013. Retrieved June 9, 2013. ^ a b "Dontrelle Willis Stats, Splits = ESPN". Espn.com. Associated Press. June 13, 2013. Retrieved June 13, 2013. ^ "Chicago Cubs vs. Florida Marlins – Box Score – July 8, 2005". Espn.com. Associated Press. June 13, 2013. Retrieved June 13, 2013. ^ "Dontrelle Willis Game By Game Stats and Performance". Espn.com. Associated Press. June 13, 2013. Retrieved June 13, 2013. ^ "Willis fans seven, allows three hits". Espn.com. Associated Press. June 13, 2013. Retrieved June 13, 2013. ^ "Willis leads majors in shutouts with five". Espn.com. Associated Press. June 9, 2013. Retrieved June 9, 2013. ^ "Willis breaks Marlins record for wins in season". Espn.com. Associated Press. June 13, 2013. Retrieved June 13, 2013. ^ "D-Train chugs to 20th win as Marlins rout Nationals". Espn.com. Associated Press. June 9, 2013. Retrieved June 9, 2013. ^ "Willis gets major league-leading 22nd win=ESPN Internet Ventures". Espn.com. Associated Press. June 9, 2013. Retrieved June 9, 2013. ^ a b "Dontrelle Willis Statistics and History". Baseball-Reference.com. Baseball-Reference.com. Associated Press. June 3, 2013. Retrieved June 3, 2013. ^ "D-Train's near-CG powers Marlins to ninth straight win". Espn.com. Associated Press. June 9, 2013. Retrieved June 9, 2013. ^ "Marlins ride D-Train grand slam, pitching past Mets =ESPN Internet Ventures". Espn.com. Associated Press. June 9, 2013. Retrieved June 9, 2013. ^ "Do-it-all Dontrelle: Marlins P cools Mets, hits two HRs". Espn.com. Associated Press. June 9, 2013. Retrieved June 9, 2013. ^ "Dontrelle Willis: first pitcher since 2004 to hit two home runs in a game". Smoaky.com. cheaptrick77. Associated Press. June 9, 2013. Retrieved June 9, 2013. ^ "Dontrelle Willis Statistics and History". Baseball-Reference.com. Baseball-Reference.com. Associated Press. June 3, 2013. Retrieved June 3, 2013. ^ "Yearly League Leaders and Records for Earned Runs". Baseball-Reference.com. Baseball-Reference.com. Associated Press. June 3, 2013. Retrieved June 3, 2013. ^ "White Sox touch up Willis, drop new-look Tigers to 0-5". Espn.com. Associated Press. June 9, 2013. Retrieved June 9, 2013. ^ "Cabrera drives in four runs as Tigers topple Royals". Espn.com. Associated Press. June 9, 2013. Retrieved June 9, 2013. ^ "Morton shines as Pirates beat Reds 2-0". sports.yahoo.com. Will Graves. Associated Press. June 9, 2013. Retrieved June 9, 2013. ^ Gelb, Matt (December 13, 2011). "Phillies sign Dontrelle Willis to 1-year deal". The Philadelphia Inquirer. Retrieved January 22, 2015. 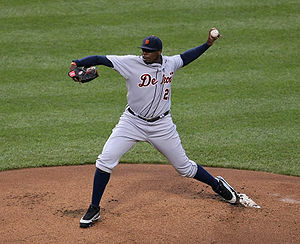 ^ "Orioles sign LHP Dontrelle Willis to minor league contract", Baltimore Orioles press release, Wednesday, March 21, 2012. ^ Seidel, Jeff. "Willis files grievance", MLB.com, Wednesday, April 25, 2012. ^ Ghiroli, Brittany. "Orioles announce D-Train has retired", MLB.com, Monday, July 2, 2012. ^ Clark, David (July 6, 2014). "Ex-Red Dontrelle Willis signs with Bridgeport Bluefish". The Cincinnati Enquirer. Retrieved January 22, 2015. ^ "Dontrelle Willis to Make Bluefish Debut July 18". Atlantic League of Professional Baseball Clubs. July 18, 2014. Archived from the original on January 22, 2015. Retrieved January 22, 2015. ^ "ESPN – Carpenter wins National League Cy Young Award – MLB". sports.espn.go.com. Retrieved 2008-06-10. ^ "The Official Site of The Florida Marlins: News: Notes: Willis elevated in order again". florida.marlins.mlb.com. Archived from the original on 2007-10-30. Retrieved 2008-06-10. ^ "The Official Site of The Florida Marlins: News: Willis garners 2005 Spahn Award". florida.marlins.mlb.com. Archived from the original on 2007-12-21. Retrieved 2008-06-10. ^ a b Rodriguez, Juan C. (December 23, 2006). "Willis Charged With Dui". Sun-Sentinel. Retrieved 6 August 2015. ^ "Baseball: Pitcher pleads guilty to reckless driving". The Honolulu Advertiser. Associated Press. April 15, 2008. Retrieved 6 August 2015.